If Shock! is accessed from R&D, the Runner must reveal it. When the runner accesses Shock! do 1 net damage, even if it is not installed. A trap for archives you say! 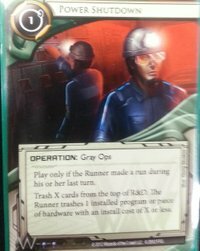 Runners won't be keen on trashing it with a 2 cost and they certainly won't be running on archives too often with 2 of these there. Datasucker counters just got more expensive! Potentially some nice synergy with Replicating Perfection at least getting the investment back. I can't see too many occasions where the runner wouldn't look to trash this though. Potentially a Pad Campaign replacement for Jinteki though. Probably no more than a 1 of in most decks, but I think it may make a very strong 1 of in most decks. 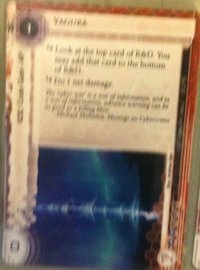 Another card the corp can leave unrezzed until the appropriate moment, killing a 3-4 strength Atman for only 3c is nothing to sneeze at. When you score Unorthodox Predicitions choose sentry, code gate or barrier. 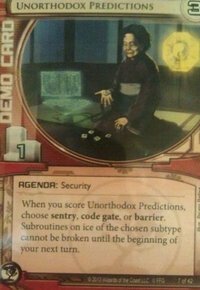 Subroutines on ice of the chosen subtype cannot be broken until the begining of your next turn. 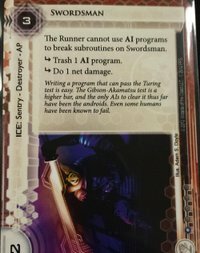 Having a turns respite after scoring an agenda is strong, it is very unlikely that a Runner will run on any unrezzed ice if you've opted for unbreakable sentry subroutines. Not a massive fan of 3/1 agendas myself and I'm not sure if I can see this replacing Gila which is far more useful over a longer game. Like swordsman, this card is all about AI breaker hate and another good 1 of option. There's no doubt that Atman and Crypsis are going to have a much harder time after this cycle has concluded. Not too bad as early game ICE either, potentially strong. Very strong in the opening hand, potentially finding the cards you need early or sticking vunerable agendas at the bottom of your pile. 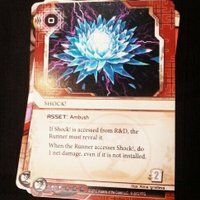 Mind game potential looks fun, is the card you left on stop a snare or shock? Feel free to run and find out. Also, with only a 1 rez cost, it may retain some mid game usefulness against any deck that doesn't have a yog.0 in. 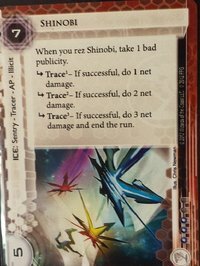 The chances of pulling off 6 net damage is probably remote with Jinteki economy, they really can't afford to pump up traces. Still, this ICE is a win condition on it's own. I don't think I would rez this unless I had the flatline with it, which isn't beyond the realm of possibility (as the innermost piece of ICE on a server anyway). 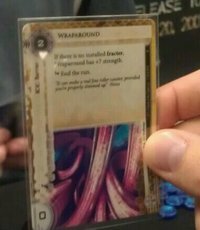 Meh, would rather play Chum under most circumstances but could find a loving home in a HB bioroid deck. 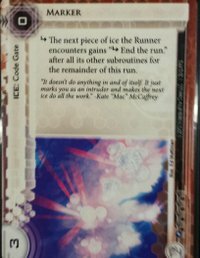 Whenever the Runner passes all of the ICE protecting this server, you and the Runner secretly spend 0c, 1c or 2c. Reveal spent credits. If you and the Runner spent a different number of credits, end the run. Interesting. First off, bear in mind she's unique so you can only use her on one server at a time. Also, as soon as the runner guesses your amount correctly, she's outta there. With that in mind however, this is potentially a very strong card that can shut a runner out indefinitely (or for as long as you're lucky anyway). 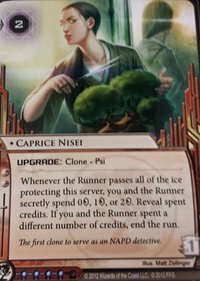 Can see this finding a home in my Jinteki deck, my agenda server can't wait to see her! Hive loses an -End the run subroutine for each agenda point in the Corp's score area. 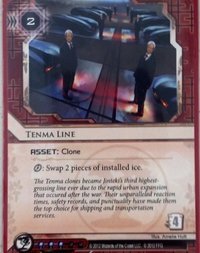 Very good early game ICE, esp in Weyland, home of the 1 point agendas. There's no getting around the fact that this is one costly card to break through, potentially backbreaking early-mid game. Probably an auto include in any Weyland with potential for being splashed. Chums partner in crime. Good for protecting a vunerable server when you need it too. Being able to move powerhouse ICE around for a click isn't too bad, especially with a trash cost of 4. 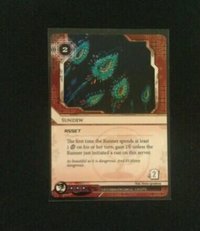 Not sure if I'll find room for it in my Jinteki deck, I really don't know what I would cut for it. Having said that, it has some potential, certainly not ruling it out. 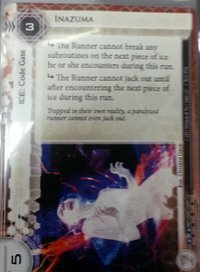 - The Runner cannot jack out until after encountering the next piece of ICE during this run. Very strong. This into an Ichi, Roboturret, Katana or maybe our new friend Shinobi is going to be painful. Str 5 is the icing on the cake, it's expensive to break through and out of Yog.0 range. Almost certainly a 1 of, probably a 2 of in a Jinteki deck for me, this will sting like buggery. Effectively, it's a useful version of Whirlpool. Situational for me. First off, you're going to want Action Jackson out before you play this card but at the same time, the strength of this card lies in the early game. The best time to play this is turn 2-4 when the runner can't pick a program they don't mind losing as their options are limited. Don't think this one will see play but it's another nice trick for Weyland that isn't Scorched.